Lovell Johns were contacted by an advertising agency to produce a quirky pictorial map for the Orange customer magazine, a vibrant and engaging World Map displaying network coverage. 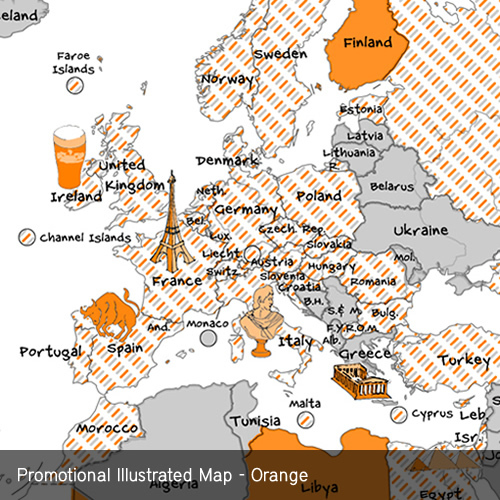 We were able to use our own copyright World Map which was adapted to match the style of the Orange brand. Key features such as the Eiffel tower were individually drawn and the network coverage area shaded to match the brand colours. The map was delivered to the Agency on time and discreetly allowing the Agency to remain in full control of their client.